I made these slippers for my roommate last year. She loves them! Someone requested I share the pattern, so here it is! A couple of things first: These are INDOOR SLIPPERS ONLY. They aren't suitable for going outside, and from what I've seen the white yarn won't clean up completely unless you bleach it, which will ruin the yarn. So only wear them inside, k? sk - skip this many stitches. 2-x (dec): 2sc first st, 1sc x. If there's a dec after this instruction, replace the 2sc with sc2tog. After row 10, join red between 9 and 10. sl st around. Mark out 28 st at toe. Join red next to the mark. 12: ch3, sk 2, sc to last 2, ch2sk1, sc last. 14: sc2tog, sc to last 2, sc2tog. 15: ch3, sk2, sc to last 2, ch2sk1, sc last. 18: ch3, sk2, sc to last 2, ch2sk1, sc last. 21: ch3, sk2, sc to last 2, ch2sk1, sc last. 22: sc2tog, sc to last 2, sc2tog. 24: ch3, sk2, sc to last 2, ch2sk1, sc last. 27: ch3, sk2, sc to last 2, ch2sk1, sc last. 28: sc ea. fasten off. TOE AND TONGUE -- join white in the same sp as the first st of red. 7: sc2tog, sk 1, sc2tog. fasten off. break white. Join red at the top of the high-top, just behind the first lace hole. sc down one side, across the edge of the toe (where the white toe meets the red tongue) and up the other side. Fasten off. And there you are! Make the other one and you're good to go! When you finish the row for the shoe portion are you supposed to chain one and then turn? Sorry this isn't written in; I'm so use to doing things a certain way that I forget to write them down! (ch1, turn) if the first st is a sc, and (ch2, turn) if the first st is a hdc or dc. If the first st is a sl st, don't ch. Aww man! That's what I was doing, since I crochet often and kind of figured you just left it out. But when I got to row 25 on the show portion I did not have 33 stitches so i figured I did something wrong and took it out until row 13. I then retried it with no chain and sc sc2tog into the same stitch as the turning but still ended up with more than 33 stitches. 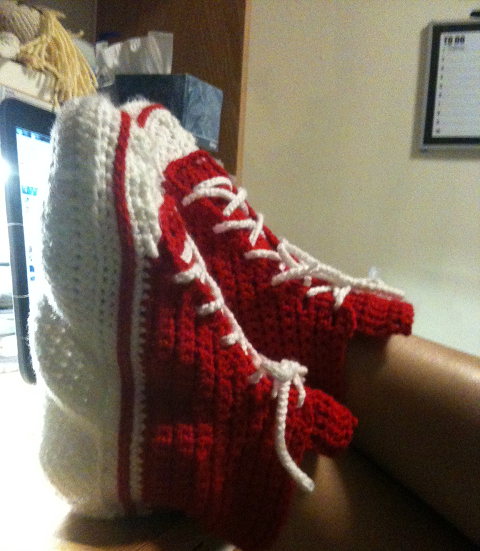 Im almost done with the 1st shoe and it looks good, just bigger than it should be up top maybe? Unless otherwise specified, never do more than one st in the same stitch, and treat chain spaces as 1 st. That may help solve your problem. But if it looks fine, and just has more stitches than it should, don't sweat it; it's possible I miscounted the number of stitches, you know? Just make a note of how many stitches you have and make sure the other shoe matches. Thank you so much for offering this lovely converse slipper pattern. I recently made some baby converse for my soon to be niece and her daddy wants a pair now. I'm going to try making a bigger pair using yours as a basis. Do you happen to have your final measurements so I might know how much bigger they need to be made? What size hook did you use and what size will this pattern fit? I used a G hook and the finished product was an 8 women's (American sizing). My son's girlfriend asked if I could make these for her but I'm really confused right from the start. How did you get 54 sts on a chain of 23. And some places you have the number of sts then the type of stitch followed by the type of stitch with the number ( sc 11, hdc 10, 9hdc, hdc 10, sc 10, 4sc).Obviously I'm missing something here. Can you explain? y means "repeat for this many stitches"
So the line you pointed out means "sc in the next 11 st, hdc in the next 10 st, 9hdc in the next st," etc. Does that make sense? You're crocheting in the round here (well, more sort of oval) so you go up one side of the chain and then back down the other side. Okay I think I understand. According to the way you write your patterns, I guess I was expecting to see something like 9hdc x or 9hdc 1. So if the number is in front of the stitch type it's done in the same stitch? One more question....Do you join anywhere on the sole portion? I'm about to give it a try. Wish me luck! But don't be surprised if I message you again!! LOL!! A very difficult way to write a pattern. I re-read your instr. Several times & ripped out my work more than a few times also. It took me 3 days (with breaks) to finish the 1st slipper. Now I should be also be to complete my project! Hello, I am working on a pair for my best friend.Not sure if anyone has noticed, but in round 3:hdc23,3hdc.It should be hdc23,2hdc.Just thought I would point that out.You do have a difficult way of writing a pattern and I am a pretty good crochet and do pretty well at reading patterns.So far I'm getting, but you may want to look into some different ways of writing patterns.Do want to thank for this one though because you can't find one for adults that's free, so your time is appreciated! Has anyone re-written this pattern in standard crochet pattern writing terms. I would love it. But I am afraid that this pattern would cause much frustration. I guess I may just have to purchase a pattern and have peace of mind. I did this exactly the way it was written and it came out big enough for a giant. I must have misunderstood something somewhere. I appreciate the effort that you put into this pattern, but I am very experienced and still had a hard time understanding it. I love this pattern! Made a pair for a disabled friend who can no longer wear regular Chucks and he loved them! I did embellish them a bit, strip up the heel and a white circle with a blue star on the side. They look great! I found the pattern easy to follow, but I have made slippers in the past with similar directions, so I could infer what to expect to do. I think your pattern is very easy to understand. I've been knitting for approximately 30yrs and crocheting while not as long but if you can follow a knitting pattern with all its abbreviations then crocheting I think should be easier but that's just my opinion. Many thanks for your patterns. I understand the instructions now but I have made similar slippers for baby converse My project turned our bigger than a size 8 should I have used DK 3? I do love the design. After the chain 23 how do you start the first row, not sure how to start the next step after the chain.